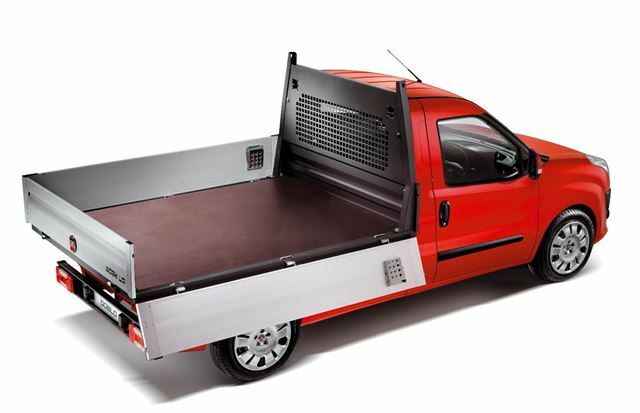 The Fiat Doblo Cargo is now available as a dropside pickup called the Doblo Work Up. It features a 4m2 load area capable of carrying 1,000kg. The sides of the load area are made from aluminium, while the floor is made of steel with a layer of anti-slip wood on top. There’s a step at the side to improve access to the load area. The Work Up is 4965mm long and 1872mm wide. Power comes from Euro V compliant turbodiesel engines, a 1.3-litre MultiJet with 90hp and a 1.6-litre with 105hp. They both feature start/stop and a diesel particulate filter. The smaller engine manages 55.4mpg on the combined cycle and the 1.6 returns 49.6mpg. Emissions are 133g/km and 150g/km, respectively. The Doblo Work Up costs £16,095 with the 1.3-litre engine and £17,065 with the 1.6-litre engine.